This past weekend, I was alone in the living room reclined on the couch and taking in the space. The feeling and the attitude of the room. I call it femme, friendly & bold. It is a mix of personalities that is unexpected and exactly what we were going for. We have plans of putting french doors in where the single window and gallery wall is. This is happening next month (in my dreams). Mike likes to drag his feet on these kinds of decisions while I make them on a whim. But in reality we have been talking about those french doors since we did the first walk thru of the house. Come summertime it will/would be so nice and seems like such a no brainer. 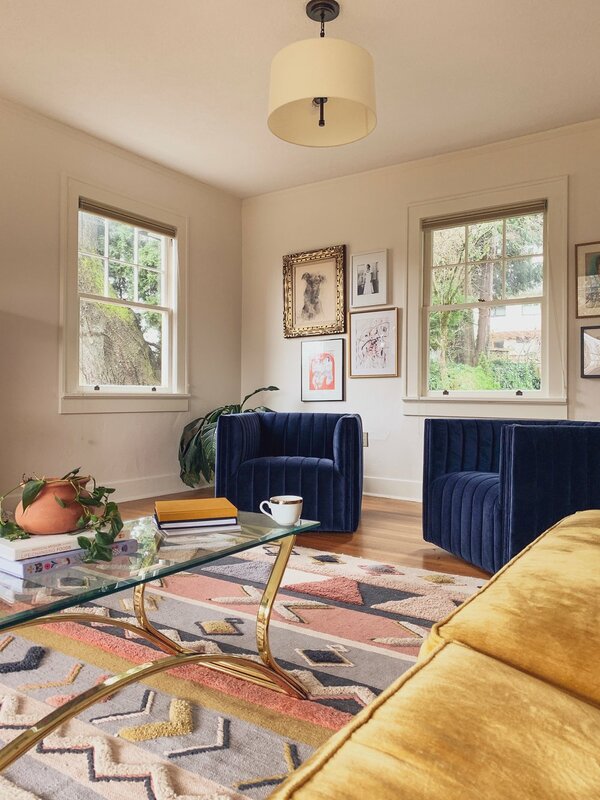 The room is a mix and match of some of my favorite local shops in Portland. The rug and chairs are the only things in the room that are not vintage. The rug gets a lot of comments whenever I post to IG or friends come over. So sharing a link to my current favorites from Anthro here.